ZenUnwired: Black Friday! Are you ready yet? Black Friday! Are you ready yet? websites that are up and running that have been able to compile all the leaked Black Friday ads and make them available to those that enjoy planning ahead. 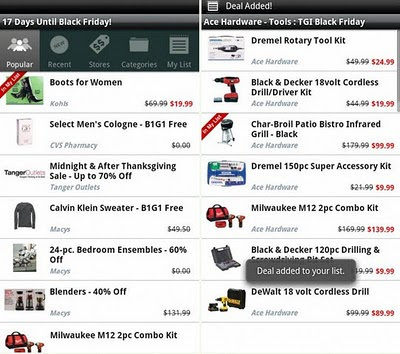 If you have an Android device however, there's the TGI Black Friday app which is currently available for FREE in the Android Market. I have been using this app for the past couple days and I've been very pleased with it. TGI Black Friday allows you to plan ahead by viewing the already several Black Friday ads that have been leaked and new deals are added as soon as they become available. The app will arrange deals based on popularity, most recently added, stores or by category depending on your personal preference. Once you find a deal that you like, you can simply use the Add To My List feature which as the name suggests creates one big list of all your favorite deals, allowing you to stay organized. If you find a deal that's so great that you just have to tell a friend, there is also an option to share specific deals with friend via email and the app will simply provide a link to the specific deal located on it's main website www.TGIBlackFriday.com. Another cool feature is that the app will also provide a .PDF copy of the actual store ad that you can download directly to your memory card. To use this feature you will need to select the Stores tab then select a specific store that you're interested in. Once you've selected your store you'll be provided with a list of various categories relevant to the deals being offered by that store. Simply scroll to the bottom of the list and select Download Adscan PDF and file will begin downloading. I'm not sure if this feature is available to every single store however so far I have not found a store where it was not. There's not a whole lot that I didn't like about this app. It's pretty straight to the point and the learning curve is pretty minimal. Of course this is not something that you will find useful all year round, but those that plan on doing any kind of shopping over the holidays should get plenty of utility from this app.